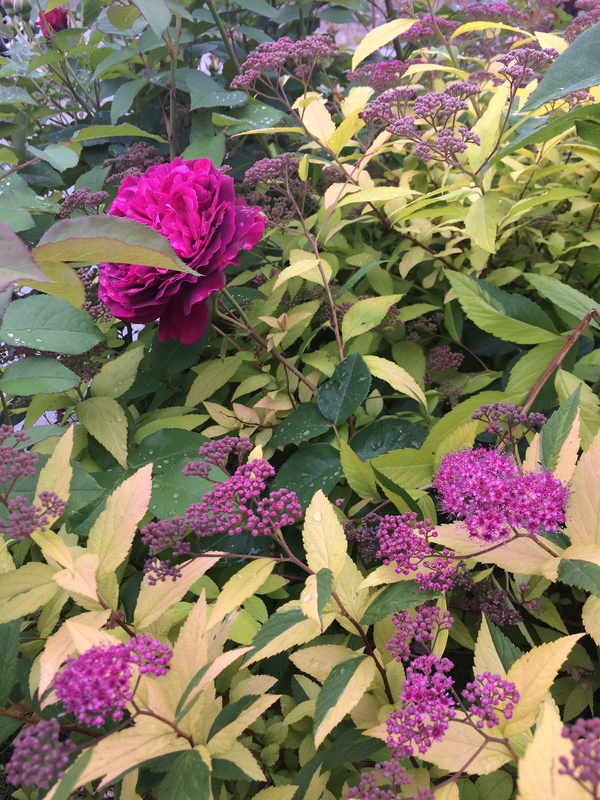 This is not an exhaustive treatment on the topic of plant combinations, but I happened to notice two serendipitous colour combinations in my own garden (serendipitous, because I assure you, it was not intentional) that I thought were worth sharing. And then expanding upon. Looking out my living room window, this is what I see first thing. 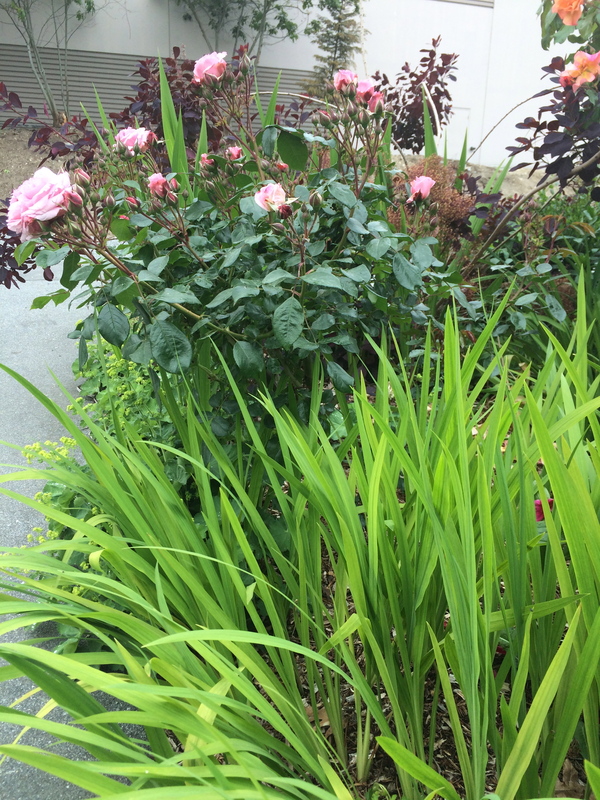 I tried in vain to reproduce the true colour of the peony–it’s much more fuschia, or cerise, or something. Even my new I-phone can’t capture those rich pinks and reds. 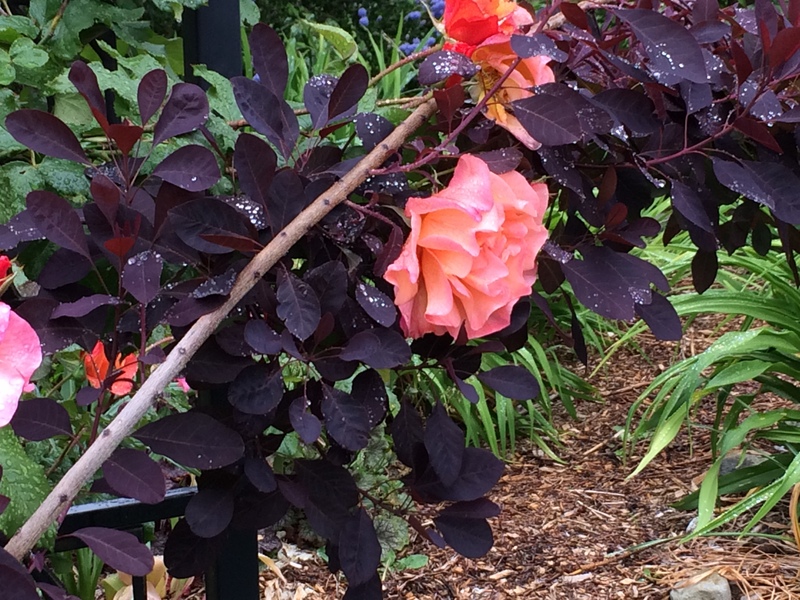 Westerland Rose and Cotinus coggygria ‘Royal Purple’. (Smoke Bush). There’s more yellow, less pink in the actual rose. 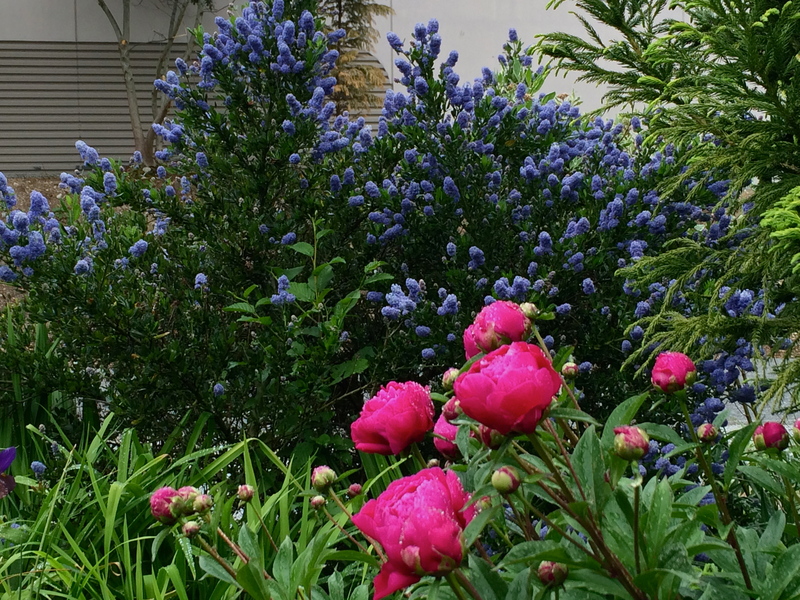 So my suggestion is that you look around at colour combinations you love, and then see if you can’t repeat them in your garden. 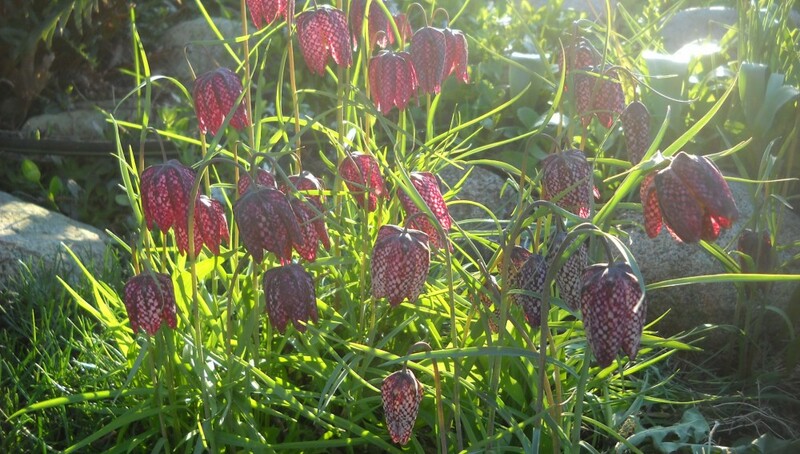 I actually saw a series of videos on Garden Design (Successful Garden Design), in one of which she advocated that same thing: if you have a garment, or upholstery, or drapes, or anything else that combines colours in a particularly delightful way, odds are good you can find plants that will do the same. That said, I would really never have guessed coral and burgundy! 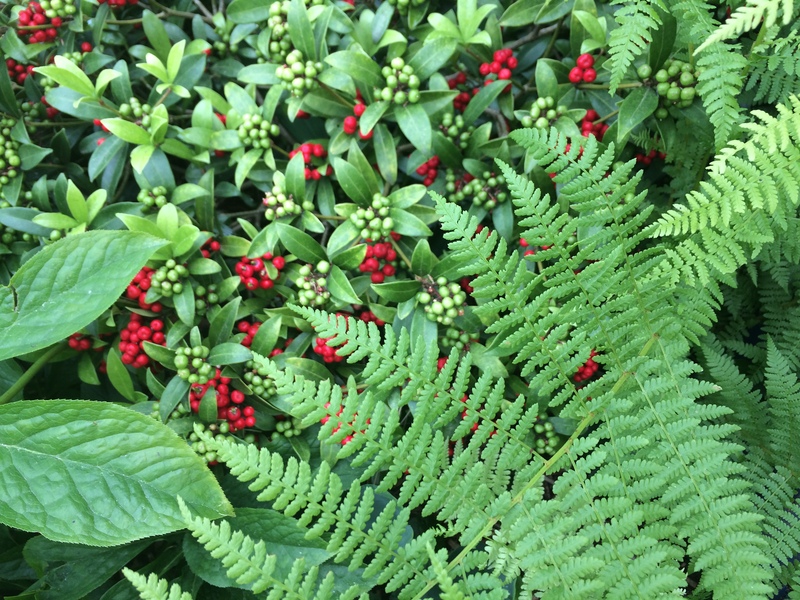 Skimmia with some kind of fern. These two very different textures create an appealing vignette, but if there weren’t those amazing red berries, the contrast wouldn’t be enough, IMO, to really make a statement. Johnny Bender Rhodo and no-name fern. This on the other hand is one of my favourite combinations: this tall fern with almost any rhodo. 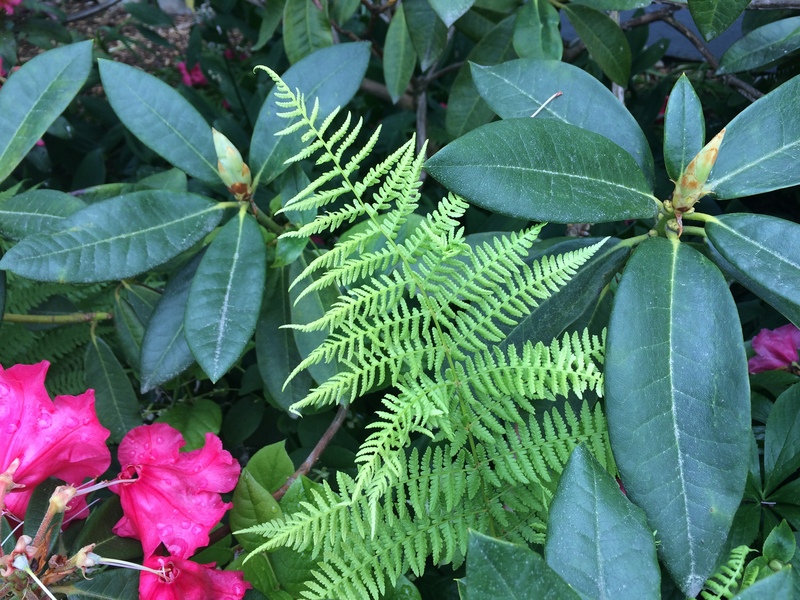 The leaves of the rhodo are a much deeper green, shiny and leathery–all things the fern is not. This was another accident–these are naturalized ferns. Doesn’t matter how often I dig them out, they reappear with vigour. 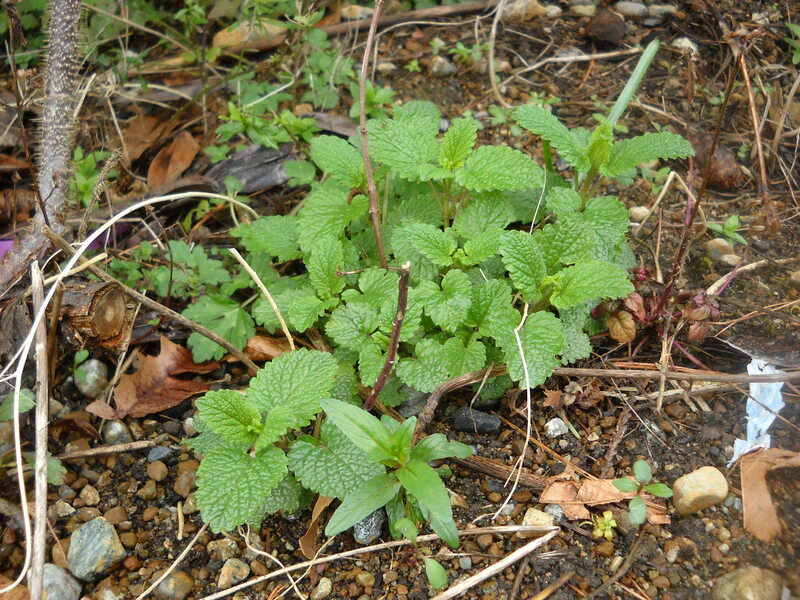 And when I saw them growing up through the rhodos I decided to be a little more lenient with their reappearances. Gaultheria shallon (Salal) and same no-name fern. I should really find out it’s name! Part of the beauty of the Salal and fern combo is the different colours in the Salal–deep green of old growth, vivid chartreuse of new growth, red stems, pink flowers. 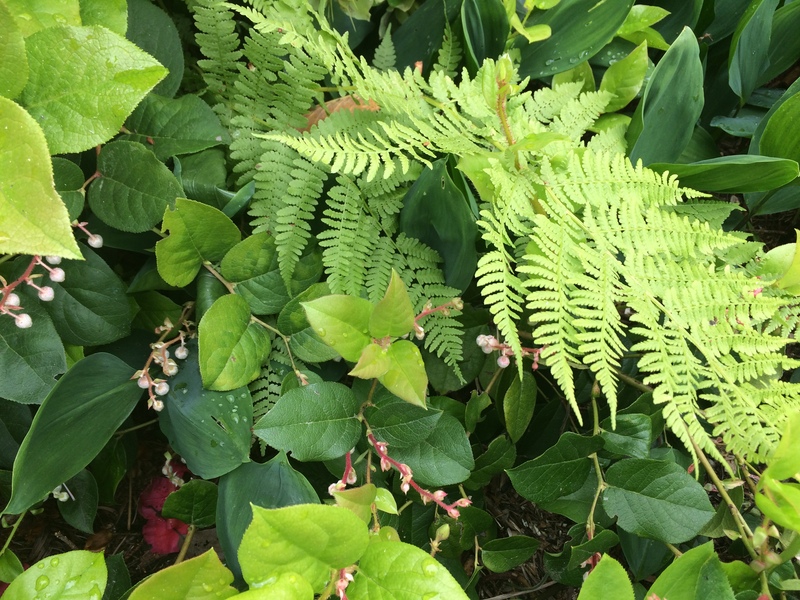 But it’s still the shiny leathery leaves (like the rhodos) contrasting the feathery (leathery–feathery…cute) ferns that really makes it work. Again, not my design, God’s I guess–the ferns self seed. 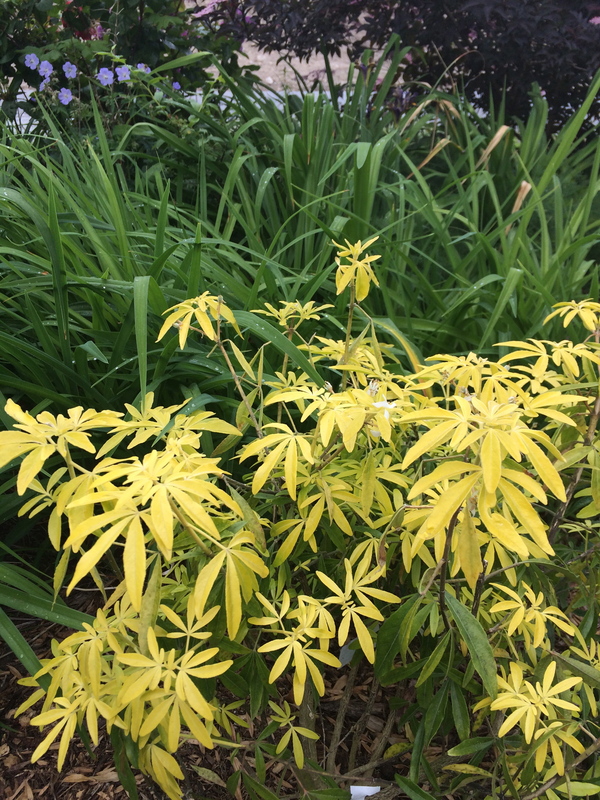 Choisya ternata ‘Goldfingers’ and my own hybridized, really no-name daylilies. Another fortuitous accident: I acquired the Choisya (Mexican Mock Orange) from a garden I was installing. 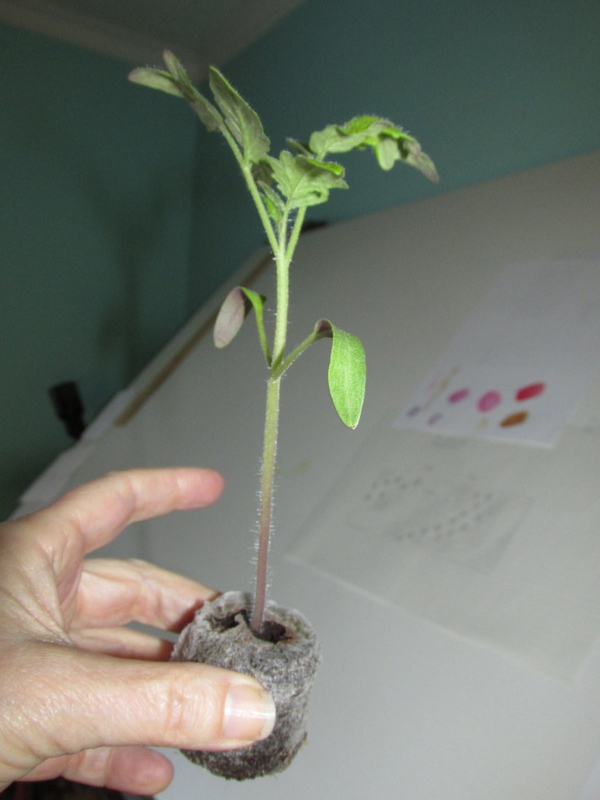 It looked really tatty, so couldn’t plant it in the client’s garden. 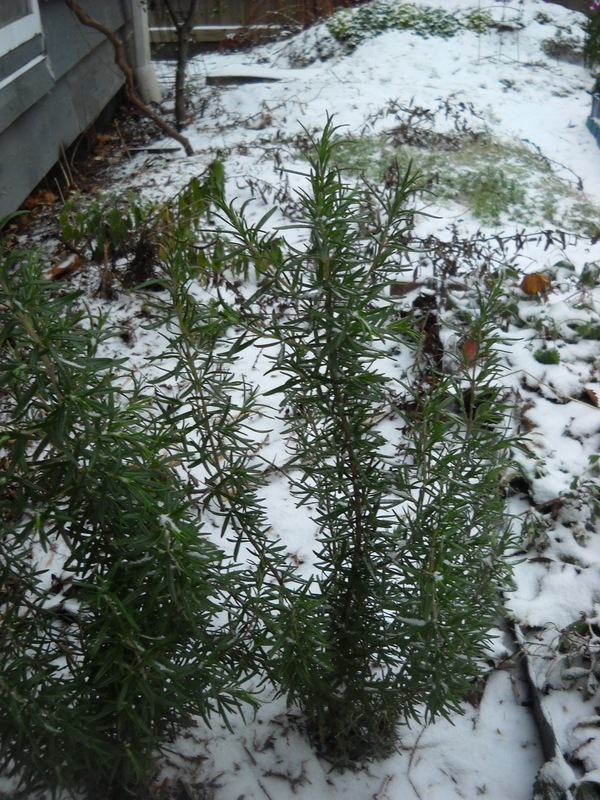 Brought it home and pruned it aggressively, then planted it where there was room. And here it is recovering and giving the heretofore boring daylily nursery some much needed interest. 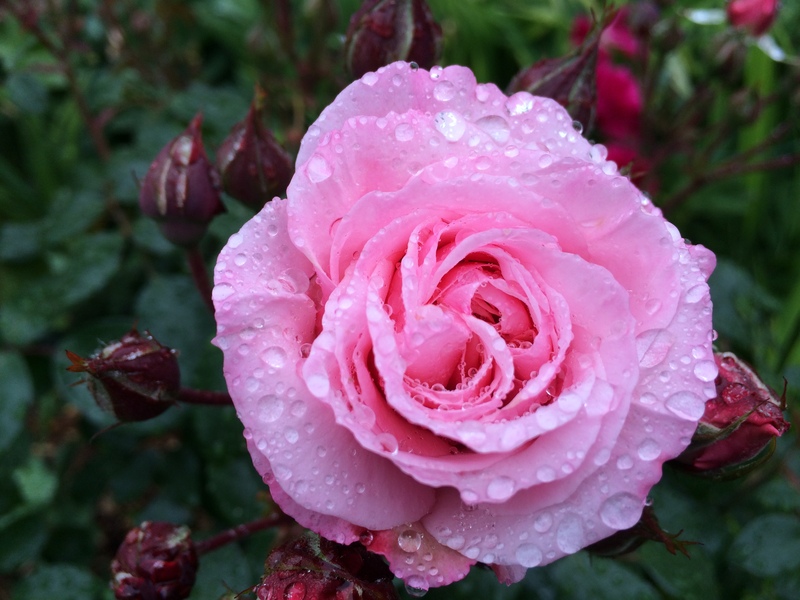 Another David Austen Rose, ‘Octavia Hill’ (I’m so glad David Austen named this wonderful rose for Octavia Hill, a British reformer of the 19th century, and one of the founders of the National Trust.) Crocosmia growing in front. Scabiosa (pincushion flower) growing underneath a Hamemelis x intermedia ‘Jelena’ (witchhazel). The textures are different, and there’s a few specks of colour–more today, 5 days after the picture was taken. But the differences are not enough to offset the complete sameness of the green. They just all meld together. The two ferns above are the perfect pair. 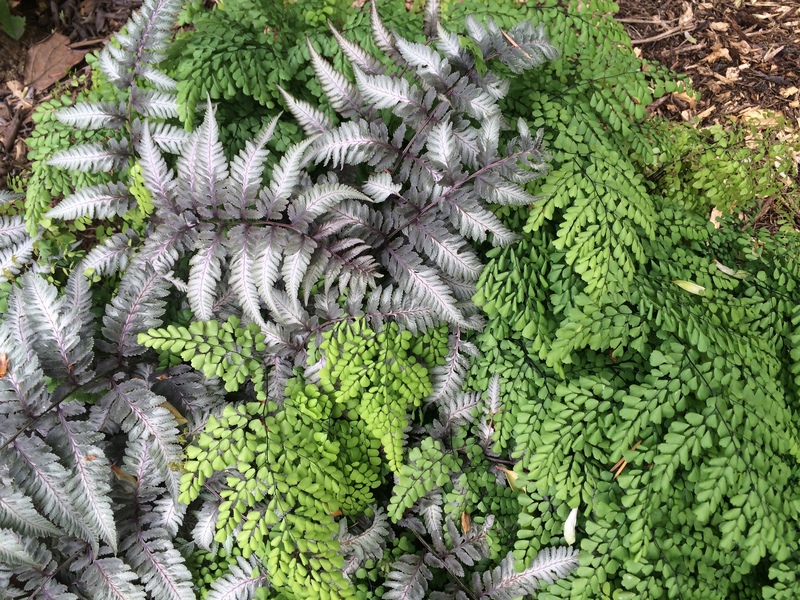 they have almost nothing in common except size–both low-growing, with the Athyrium leaf tips barely hanging over the Adiantum. Why do they look so good together? Don’t know. 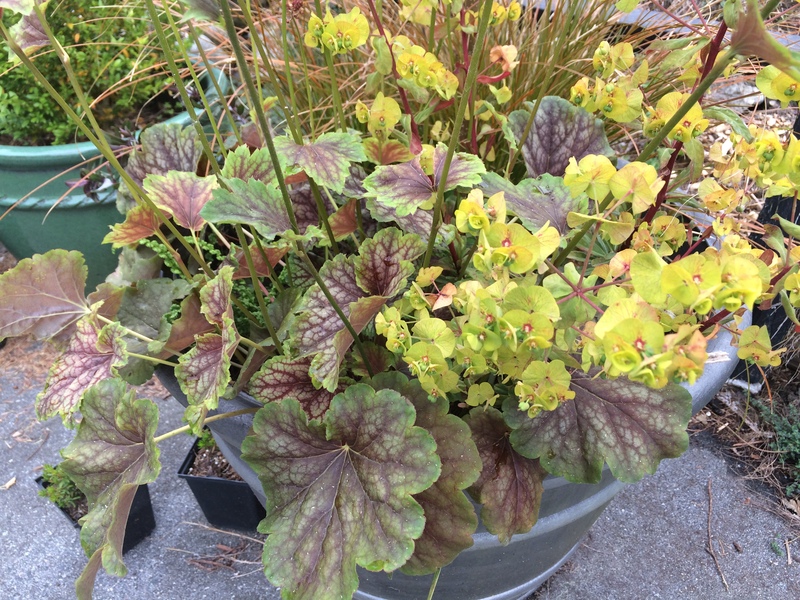 Heuchera, possibly ‘Van Gogh’, with Euphorbia martinii ‘Blackird’. This one above is a muddle of colour and texture contrast. I put them together-this one actually was intentional–because the colours are similar. Gold-ish, green-ish, and red-ish. But looking oh-so-different. 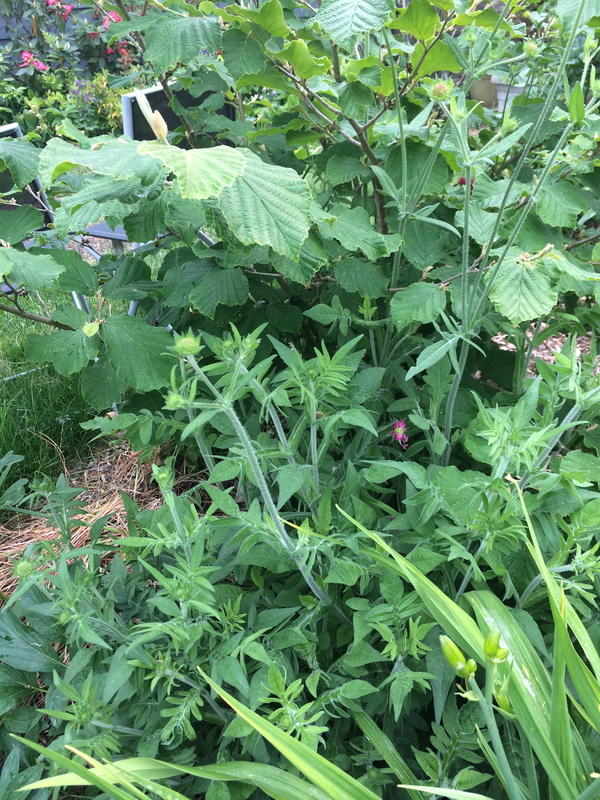 The grass, barely visible toward the back of the container, is greeny-orange, and then not at all visible is a green-burgundy hebe that ties in with the heuchera. 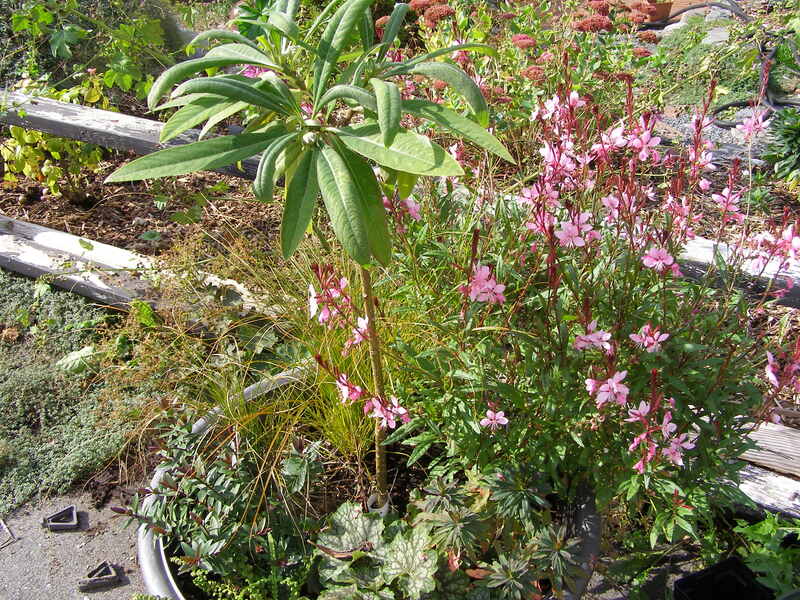 Gaura lindheimeri ‘CrimsonButterflies’ will grow up later with burgundy foliage and pink flowers. 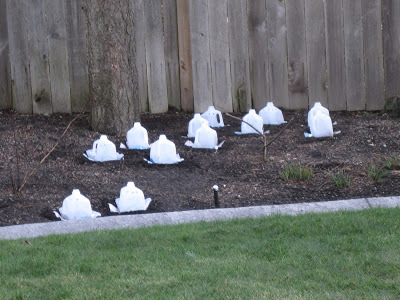 This was what it looked like last fall when I planted it up. And finally, this last accident. The William Shakespeare rose is so gangly that it spread all through the Spirea. Little did I realize that the colouring of the flowers of the two shrubs is pretty much identical. But everything else so different that it makes for a lovely combination. David Austen Rose ‘William Shakespeare 2000’ and Spirea ‘Goldflame’. Try it yourself. 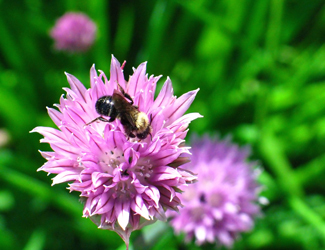 You can start small with just a container garden, or go for the gusto and really play in the garden.